Hubbell offers a comprehensive offering of steel and aluminum duct products. 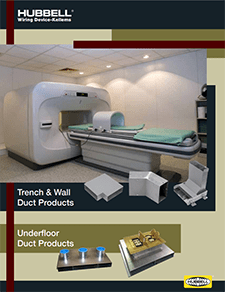 Wall and trench duct is heavily utilized in the healthcare industry. Underfloor duct is ideal for hotel, retail, casino, and convention center applications. Hubbell’s ability to design customized products for challenging projects can be an important resource for contractors and end users looking for the right product to meet demanding applications. Duct is available in a wide variety of widths, depths, and styles. Contact your Hubbell sales representative and provide job name, location, drawings, and specifications for the duct project. Quotation and production lead time will be provided. Hubbell includes ground freight charges in each quotation. If submittals are needed, these will be completed once purchase order is issued to Hubbell. All trench duct and wall duct orders are shipped under a generic TW prefix number, while floor duct projects are shipped under a generic FD part number.